Bauble Blues by James Carter (taken from Read me and Laugh: A Funy Poem For Every Day Of The Year, chosen by Gaby Morgan), Macmillan, 2005. This poem was originally published in Cars, Stars and Electric Guitars by James Carter, 2002. 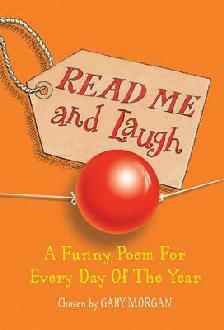 This is another great collection of verse for children, and though you do not of course have to read the poems on their appointed day, the structure does encourage incorporating poetry into daily life. The verses vary in length and are from poets old and new covering a range of topics. I had a trawl through December and found this one and another which will appear on the blog next week. two-shoes the fairy – what a life, eh?! I had never thought of Christmas decorations having sad lives before reading this short poem, now I wonder whether I should simply keep them up all year round. It is also probably just as well that we have a star and not a fairy for the top of our tree. Christmas is Coming – a traditional Yuletide nursery rhyme (Anonymous). This is another verse taken from the children’s collection Read Me that I mentioned previously on the Advent Calendar. As with many old rhymes, there are several different versions. Some say ‘goose‘ instead of ‘geese’ and some have ‘Please do put’ in place of ‘Please to put’ and so on. I did a YouTube trawl and, not surprisingly many singers have recorded Christmas is Coming in its several versions (including one by John Denver and The Muppets). The clip I have posted below is not a sung rendering of the verse, but a straightforward spoken one by someone whose name is only given as Andy. I hope it makes you feel all Christmassy inside! Many thanks to Andy who uploaded this video to YouTube exactly two years ago, on 9th December 2010.